Cameras have been around for quite some time now. There are several new cameras today that offer crisp and lifelike images and videos. If you own any of the new cameras out there, you would know about something known as a gimbal. 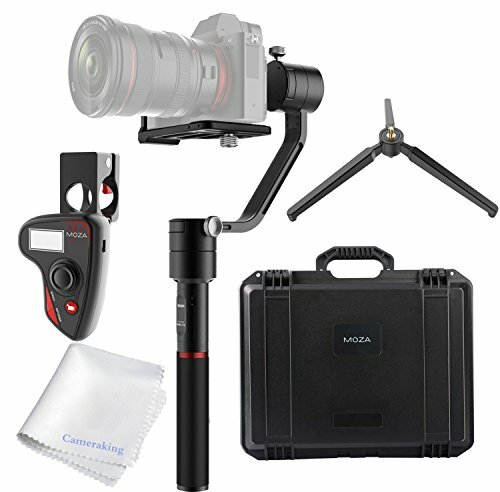 These are accessories that help you keep your camera in a steady position while recording action videos or photos. We’re going to talk about a few gimbals today in the hope that you get to pick the best one suited for your liking. Bear in mind that some of these gimbals are fairly expensive, so this is only meant for those who don’t mind shelling out upwards of $500 on a camera accessory. We’re also going to talk about a gimbal that won’t break the bank much, but will still offer the same utility as a regular video stabilizing gimbal. Cost aside, gimbals are a great investment and can completely transform the way you record videos from your camera. So without waiting any further, let’s get right to our list. This is a lightweight and effective gimbal that can hold your camera well in place with a sturdy grip to ensure you don’t drop it. 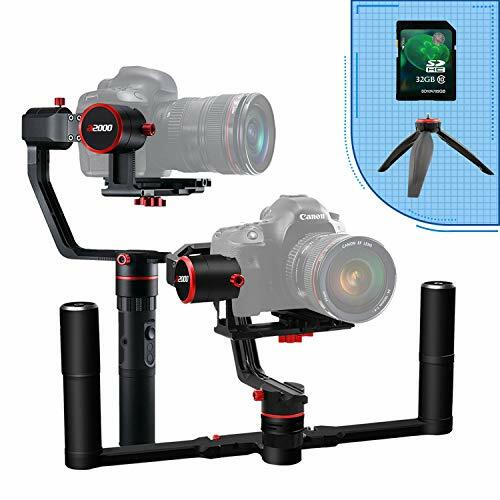 This particular gimbal supports all mirrorless cameras out there, so you have nothing to worry about as far as compatibility is concerned. Since this gimbal is used by DSLR professionals, it should handle any regular camera with relative ease. Something known as the Sport Gear Mode allows you to quickly capture amazing images and videos in an instant. There’s a standalone OLED display on board to give you details on the battery level, device connectivity status and a bunch of other metrics. This display also comes with a joystick to help you pan the gimbal around. A single button on the gimbal allows you to start shooting videos or photos conveniently. The company offers a 30-day money back guarantee along with a 12-month warranty for manufacturing defects and other issues. You will have to shell out $575 for this camera gimbal on Amazon. This is a slightly unconventional offering on this list as it doesn’t come with the form factor of a traditional gimbal. It is small, and can be operated with one hand. However, it doesn’t have the attachments to record videos or snap photos for prolonged intervals. It does its job perfectly, though, and that’s pretty much what everybody wants. The form factor of the Roxant Pro allows for one handed operation, which can be handy with a smaller camera and not necessarily with a bulky DSLR. In the company’s words, this gimbal offers the ability to shoot videos in “pro style” and can offer better image stabilization compared to other products on the market. It can hold cameras of up to 2.1 lbs, so the bulkier DSLRs are probably going to struggle with this gimbal. Be sure to refer the user manual for additional instructions on the product. Warranty information hasn’t been mentioned by the seller, but we’re assuming a standard 12-month warranty applies for this product. 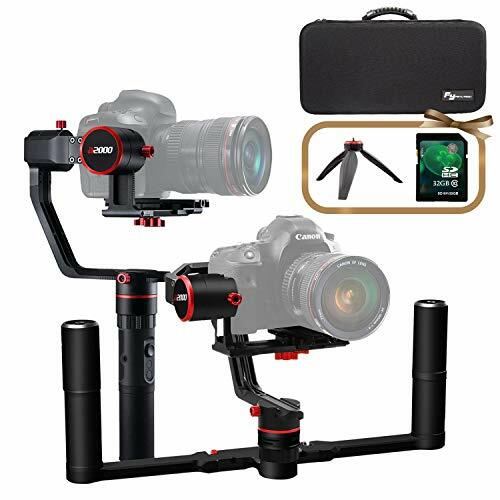 Given the smaller size, this handy gimbal is only priced at $64.95 on Amazon, making it one of the cheapest gimbals on this list. With a payload of up to 5.5 lbs, this can handle pretty much any standard or DSLR camera on the market. The design of the a2000 accommodates continuous video recording, making this ideal for filmmakers among us. There’s a small cable that connects the gimbal with the camera. This allows the camera to be operated using the buttons onboard the gimbal. 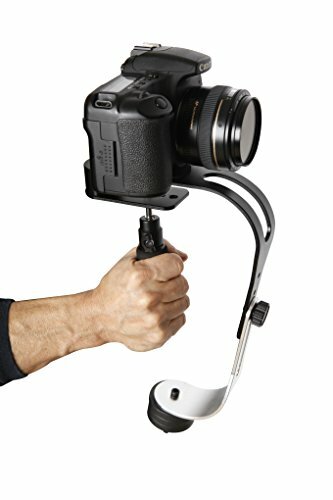 If you’re too intimidated with the big handle on the gimbal, you will be pleased to know that it can be removed, allowing you to use the gimbal with just one hand. It is imperative that you calibrate your camera well before you use the gimbal to get the best results. The gimbal is ready to use as soon as you unbox it from the retail packaging, so there’s no requirement for an elaborate setup process. What I personally like about this gimbal is the add-on accessory that allows you to use it two-handed. Not many gimbals provide this by default. The FeiyuTech a2000 $549.99 and can be purchased via Amazon. One of the popular gimbals for DSLRs, this one works perfectly well with most cameras as well (mirrorless included). 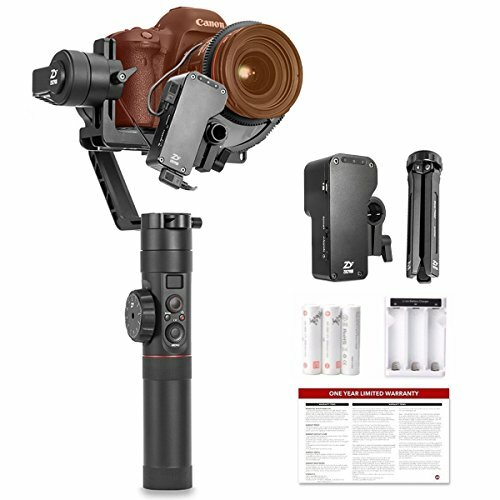 What’s amazing about this gimbal is that it can work for about 18 hours on a full charge, which is enough time for a day’s worth of shoot. There’s an OLED display on board to give you details on the various parameters of your camera. It can take up to 7 lbs of payload, which makes it ideal to be used with a number of cameras, including DSLRs. The gimbal is pretty well built, so you have nothing to worry about as far as durability is concerned. 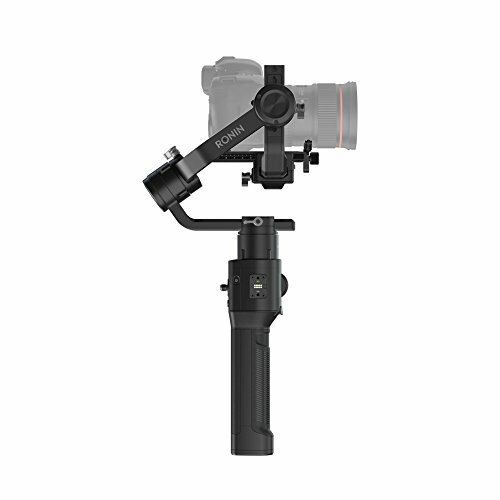 The company offers 1-year of warranty with the gimbal, with an additional 6-month warranty provided by the company. So you can be assured of the device’s quality and performance for the duration of its life. The Crane 2 is currently unavailable on Amazon, but is expected to get back in stock shortly. It’s impossible to keep DJI out of the action given the popularity it enjoys in the gimbal game. Unlike other bulky gimbals, this one is easy to handle and suitable for single-handed operation. This works with a number of DSLRs and Sony mirrorless cameras, so you shouldn’t have a problem finding a compatible camera. The gimbal comes with all the controls necessary to pan and rotate your camera. Given the ease of use, this gimbal can be used by both amateurs and professionals. The Ronin-S charges over a USB C cable, with one provided with the gimbal. It allows you to have three profiles to use the best one suited for your liking, and switching between profiles is not too hard either. This handy gimbal will set you back by $899 on Amazon.